This is the 8 count box Tip Collection line of boxes sold exclusively at Walmart. Who is Tip you ask? On the back the 2014 64 count box it says Tip is "more of a spirit than a person. In fact he so loved the creative energy in kids that he decided to take the form of a Crayola Crayon way back in 1903." That is the same year the first Crayola crayon was made! 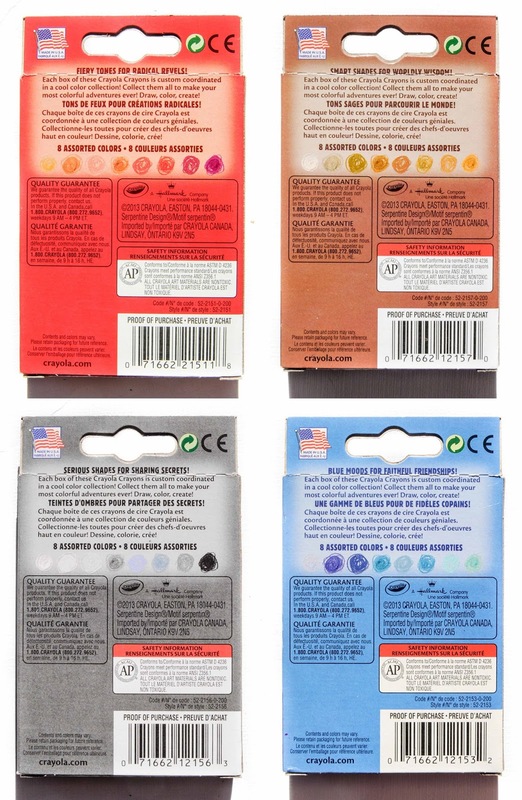 Crayola came out with the Tip Collection a couple years after the Target "Pick Your Pack" boxes debuted in 2013. It was Walmart's way to compete with the Pick Your Pack boxes. I have to admit I like collecting these ones slightly better. I like that these boxes are colored coordinated and they feature Tip on the box. I used to be obsessed with organizing my crayons by color. Not sold in stores anymore, but not rare yet. There are still many sets for sale on 3rd party websites.